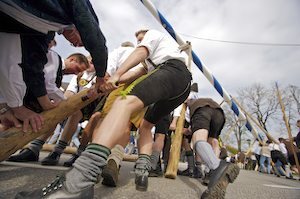 A team of no less than 30 burly blokes (dressed in original traditional Bavarian lederhosen) use wooden poles to inch the tree into position - a feat that lasted around 3 hours. Of course the men are egged on by the ladies who are dressed to the max in their traditional Bavarian dirnl’s (without the girls the event would not happen because they bring on the beer to keep the men working hard to raise the tree). Each hoist earned the men applause by the locals who were gathered around the tree to watch the events unfold while eating “weisswuerstl and pretz’n” (besides drinking yummy Bavarian beer)!